With a unique three-layer architecture, Snowflake says it can run hundreds of concurrent queries on petabytes of data, while users take advantage of cloud cost-efficiency and elasticity -- creating and terminating virtual warehouses as needed -- and even self-provisioning with no more than a credit card and about the same effort it takes to spin up an AWS EC2 instance. "It turns out that the data warehouse is one of the pivot points, a tentpole thing, that customers have to move because if the data warehouse continues to live on premises a massive number of systems surrounding that data warehouse will continue to live on premises," Muglia says. And even well-funded, big enterprises like banks are attracted to cloud cost-efficiencies, Muglia points out. "If you've got some quant guy who wants to run something and all of a sudden needs a thousand nodes and needs it for two hours, it's kinda nice to be able to do that really quickly then have it go away versus paying for them 365 days a year." -- Add the ability to do cross-region data replication. Right now, Snowflake's Data Sharehouse allows for real-time data sharing among customers only within an Amazon region. The ability to replicate across continents should open up doors to global enterprises. -- Run on another cloud provider. Muglia has been coy about which provider it will be, but concedes it's likely to be Microsoft Azure. Cross-provider replication is also in the works, Muglia says. -- Continue to work on the system's ability to interoperate with various tools that its customers use. Customers often use certain database tools and add-ons for years, even after vendors stop updating them, and customers want new systems to work with them. There are, however, a gaggle of players vying to be the online data warehouse of choice for enterprises. 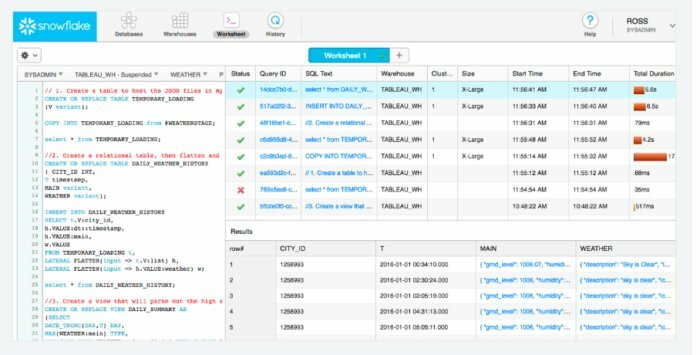 Snowflake must contend with, for example, Microsoft Azure's SQL Data Warehouse, Google's BigQuery and Cloud SQL -- where users can run Oracle's MySQL -- as well as RedShift from Amazon itself. But Muglia contends that Snowflake's unique architecture allows it to scale way past traditional SQL databases, even when they are run in the cloud. In addition, its does not require special training or skills, such as noSQL alternatives like Hadoop. "The challenge that customers have today is that they have an existing system that's out of capacity, it's overtaxed; meanwhile they have a mandate to go to the cloud and they want to use the transition to the cloud to break free of their current limitations," Muglia says. -- A cloud services layer that manages transactions, queries, virtual warehouses, metadata such as database schemas, and access control. One potential problem is that the three-tier architecture might led to latency issues, but Muglia says that one way the system maintains performance is by having the query compiler in the services layer use the predicates in a SQL query together with the metadata to determine what data needs to be scanned. "The whole trick is to scan as little data as possible," Muglia says. But make no mistake: Snowflake is not an OLTP database and it's only going to rival Oracle or SQL Server for work that is analytical in nature. Meanwhile, though, it's setting its sights on new horizons. "In terms of running and operating a global enterprise having a global database a very good thing and that's where we're going," Muglia says. Snowflake's latest venture capital round was led by ICONIQ Capital, Altimeter Capital and newcomer to the company, Sequoia Capital.